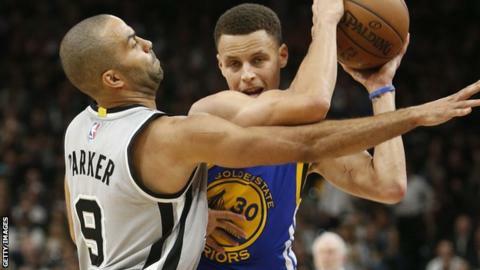 Golden State Warriors suffered a setback in their quest for an NBA record of most wins in a season after losing 87-79 to San Antonio Spurs. Warriors are 62-7 for the campaign and must win 11 of their final 13 games to beat Chicago Bulls' 1995-96 mark. Spurs restricted Warriors to their lowest points in a regular-season encounter since February 2014. And their own 59-10 record leaves them three behind the Warriors in the race for top seeding in the play-offs. Warriors guard Stephen Curry only added one-three pointer from nine attempts in a total of 14 points, but extended his own NBA record-breaking tally for a season to 337 baskets. Is Steph Curry the new Michael Jordan? Read more on Steph Curry: Is NBA star really the new Michael Jordan?